There’s a funny paradox about fear. It’s real but not. A construct of our minds, a feeling designed to keep us safe, a protective tool that says things like “stop”, “careful now”, “hide”, “danger”, and “run very far away as fast as you can”. Fear is developed after we learn about pain but before we can distinguish between emotional and physical hurt. There are times when fear serves a vital purpose. For me, most times fear plops itself down in the middle of a beautiful open highway making movement impossible lest I crash and burn. Last week I wrote about the beauty of Taurus season; of growth, bounty and the power to endure. I proceeded to spend the week enduring a lot of pain. The irony, I realized, was that I wasn’t enduring the pain I feared. I was enduring the anticipation of pain. The pain of not living is so much harder than the pain of being awake. So, what happens when we allow the pain of living to be in our bodies? When, instead of scampering into the past or future, we stay right here? 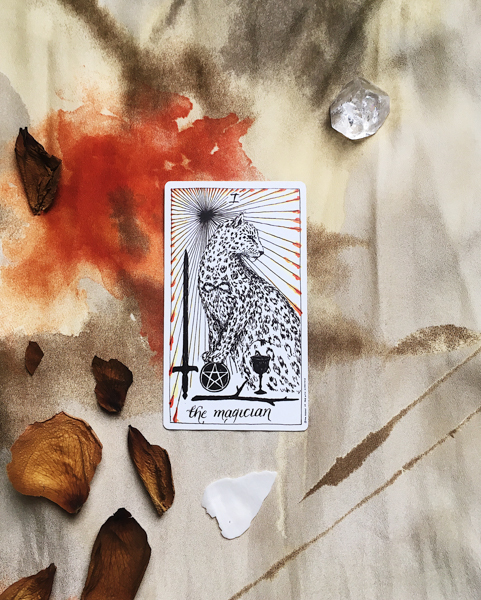 This week, the Magician is a not so subtle reminder that we have all the tools we need to move through. For me, the biggest fear is not having, doing, or being enough. Or being something that needs fixing, but is too broken to fix. The Magician asks you to step back from learned ways of perceiving and try to see what is seeing. Rather than picking out flaws, can see you see the wonder, innocence, beauty behind your ability to feel? The dazzling effect of the wind nuzzling your neck; the keen eye that catches the subway light down the track; the soft, bright sensation of toothpaste foaming up about your gums. WHAT is seeing? You are – dazzling, keen, soft, bright and so much more.. I think sometimes, “What if I come up empty?” The Magician embodies the principle of magic. Of making something of nothing. There is Magic is seeing the unseen. This week, when fear creeps up your throat, can you hold it? Can you admire the ability to sense it? Breathe before you bolt.